Apple has created a page dedicated exclusively to informing its customers about its genuine USB power adapters, following two unfortunate iPhone-related accidents (via The Next Web). Apple’s message is simple and clear. It emphasizes the company’s commitment to consumer safety and says that each of the iPhone and iPad chargers must go through rigorous testing. As you can see from the image below, Apple has posted detailed images of the chargers for the iPhone 4, 4S, 5, iPad, iPad 2 and iPad mini. 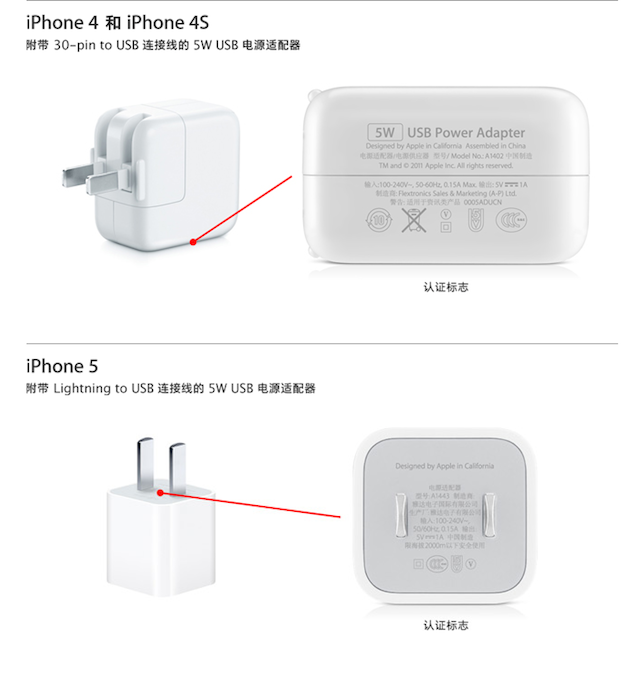 The images also show the specification for each power adapter’s corresponding power cord and highlight the official Apple guarantee labels. The page is unique to China and comes after the tragic death of a young flight attendant, who was electrocuted when answering a phone call on her iPhone 5. While the circumstances are yet unknown, Apple responded immediately by transmitting sincere condolences to the young girl’s family, beginning an investigation and ensuring the authorities of its full cooperation in the case.